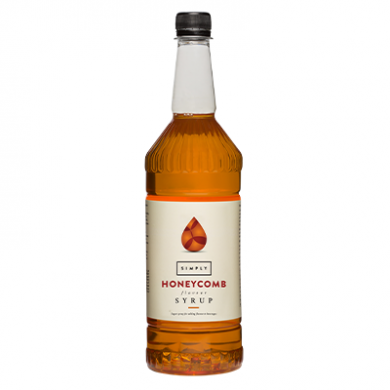 Simply honeycomb syrup is delicious and also amazing value in a large 1 litre plastic bottle. Because Simply honeycomb syrup doesn't contain plant extracts it has a longer life once opened - important if on display behind the counter near hot coffee machines. You brew the finest quality beans to create the ideal coffee or espresso and by using our delicious honeycomb syrup you can add an exquisite flavour, to make the ideal drink for any occasion. Add value to your beverage offering. Inject a delicious flavour to your beverage. Sugar, water, glycerine, natural honeycomb flavouring, salt, preservative E202, citric acid, colour E150a, E160a.